Romance is in the air at ski areas this Valentine's Day. Valentine’s Day is a big deal here in the mountains. It reminds us of our loved ones and…and…who am I kidding? It takes place on a random Tuesday, which is essentially a Saturday for ski bums. Not to mention, there’s like one girl for every eight guys so most of the time you can just ignore it. That still doesn’t mean that ski areas are going to forget about it. We’ve rustled up a few deals for this year’s Cupid bacchanalia and we’ve broken it down for all stages of a relationship. There’s no better place in the world to throw game at a girl than on a chairlift. She literally can’t escape unless a sixty foot free fall was her Valentine’s Day wish. Here’s hoping that Bear Mountain’s Ski Lift of Love comes out injury free. It takes place on Valentine’s Day from 6 to 10pm and features two “singles” lines — one for men and one for women. You still have to pay for a lift ticket, but isn’t that a small price to meet the love of your life? Let your inner exhibitionist out at Mad River Glen. When your and your someone special kiss in front of the counter guy, lift tickets are only $14. You only have to kiss. Don’t let them talk into anything else freaky. On the opposite end of the spectrum from singledom is Loveland’s 21st Annual Mountaintop Matrimony in which couples get married in a mass wedding on the slopes. 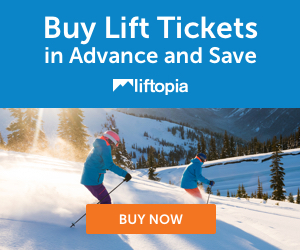 Is it worth it for the 2 for 1 lift ticket that couples receive? I’ll leave it up to you. If you don’t have a honey to smooch, there’s still a chance of scoring a sweet $14 ticket through LiftTickets.com. Act fast though because when this deal is done, you’ll have no cheap tickets and no girlfriend. Bummer, dude.